Home » Mobilight News » Base Camp…Built for Rugged Outdoor Living! 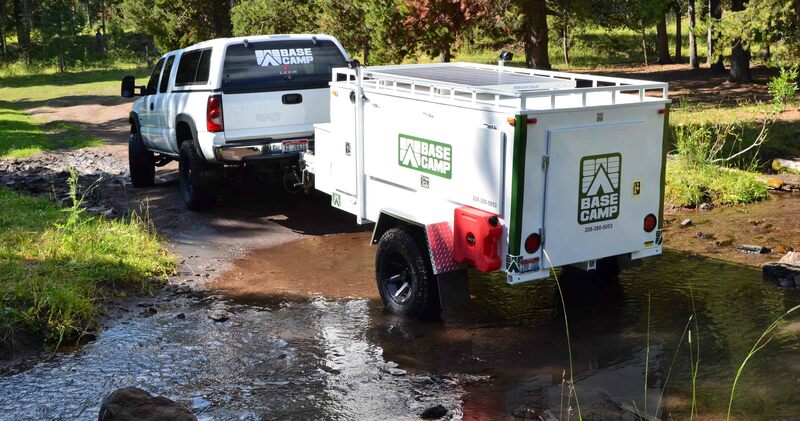 The extremely rugged base camp trailer that you have always dreamed of is here! Mobilight has a long history of manufacturing rugged oil and mining field equipment, particularly trailers. Rugged is the best word to describe the new trailer! The Base Camp trailer performs in the harshest of climates and conditions. Most trailers rattle apart when taken off road. Your new trailer is built of heavy steel and welded to last. Base Camp trailers continue the Mobilight tradition of being BUILT TO LAST. Decades of experience building off road trailers that are built to last and to supply you with all of the critical support you would expect out of a true “Base Camp”. Whether your setting up a base for search and rescue, fire camp, an incident management post, or a super base for hunting or family, this is your dream base camp! Rugged welded steel frame and enclosure with powder coated baked on paint. Solar and battery power package complete with solar panels,charges and inverters. Kitchen package, including the sink! Fire Box for wood or other storage. Gun Box for fire arms storage. Mobilight designs custom trailers for Search and Rescue teams, Fire and Police Departments, Armed Forces, Border Patrol, and other government, private and commercial entities. There are 3 basic platform designs that are standard, the Outpost model, the Base Camp Model and the Headquarters model. Each of these models are flexible in design to allow for easy additions of auxiliary power, security with thermal imaging radar and PTZ cameras, basic or broad area lighting, base of communications power and equipment racks, with the ability to quickly design built to meet almost any requirements.